Part Two – Question 1: Does ‘Letters and Sounds’ qualify as a programme? Whilst ‘Letters and Sounds’ is doubtless a very important landmark document – the consequence of a hugely significant historic set of circumstances (which I shall touch upon in Part Three), it is equally important for future teaching and learning standards (our continuing professional development) to analyse whether the publication actually qualifies as a ‘programme’ in real, or practical, terms to warrant its continued promotion as a programme in England and internationally. Six years after its publication, a proper analysis of the pros and cons of ‘Letters and Sounds’ is arguably overdue and for the sake of the teaching community and the learners, we need clarity as to whether it should continue to be regarded as a programme in its own right or simply as a framework or guidance document – or perhaps the equivalent of a programme’s manual. Even when viewed as a highly detailed framework, however, what are its merits or otherwise -and is it timely to summarise where we are to date and move on with a deeper understanding of the status quo? In England, the vast majority of schools are still identified as ‘Letters and Sounds schools’ – but what does this really mean? Most, if not all, universities for teacher-training put ‘Letters and Sounds’ central to phonics professional development for student-teachers, and across the world ‘Letters and Sounds’ is being hailed as the programme to pay regard to for high-quality systematic synthetic phonics teaching in the English language. Is this the best possible scenario for moving forwards in England and globally? 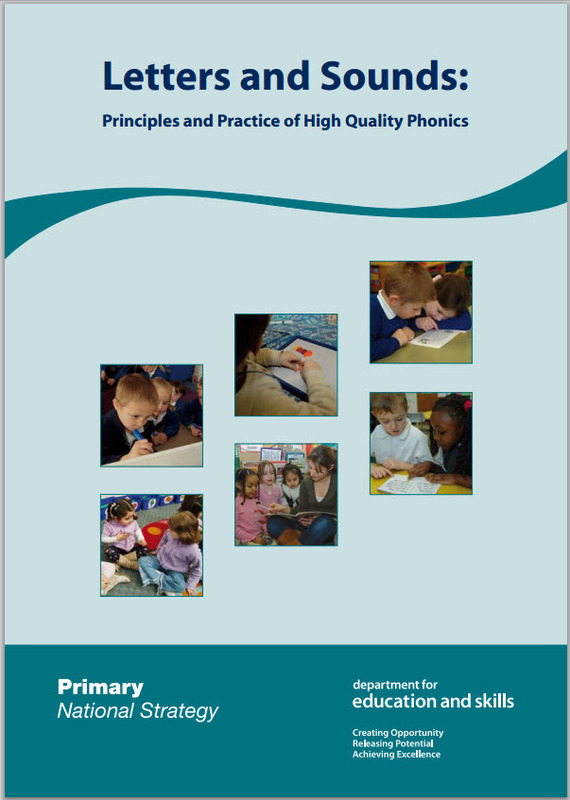 ‘In choosing a phonic programme, be it Letters and Sounds, another published programme or their own programme, settings and schools are encouraged to apply the criteria for high quality phonic work (see page 8 of these Notes)’. 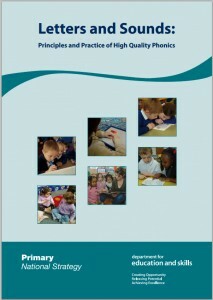 a poster showing the principles of high quality phonic-work. In reality, the Six-phase Teaching Programme document is most likely to be regarded as the actual programme which is underpinned by the teaching principles as described in the Notes of guidance document – although many teachers may well be unaware nowadays of these different materials (above) comprising ‘Letters and Sounds’ in full. Indeed, was it possibly an error of design to describe the Simple View of Reading and the core criteria in a different set of notes from the main manual because of possible separation of the two documents? What will we find when we evaluate the information in the Notes of guidance separately from the information in the main manual? Are the pros and cons equal in both documents or does one have greater value or potential longevity more than the other? So, is ‘Letters and Sounds’ a programme? No – not when the following criteria are taken into consideration – and further criteria will be brought into the picture in subsequent blog postings. The most simple and immediate way to consider this fundamental question is on the basis that ‘Letters and Sounds’ has virtually no teaching and learning resources – no stuff. In ordinary but varied circumstances, would teachers, tutors or parents be likely to seek, or choose, or buy a teaching and learning programme with no actual resources? The closest ‘Letters and Sounds’ gets to providing any resources are the six ‘Phoneme spotter stories’ in Phase Five (pages 160 – 165), a lower case ‘Letter formation’ page (Appendix 2) and possibly photocopiable ‘Example group assessment sheet for grapheme-phoneme correspondences’ for Phase Two and Phase Three (pages 201 – 202). In the scale of the need for content-rich and quality teaching and learning resources for possibly up to three years of daily phonics teaching for classes of up to 30 children of various profiles, this is shamefully paltry is it not? It is nothing less than shocking in my view that ‘Letters and Sounds’ was ever considered to be a viable programme of choice on this basis alone, regarded as comparable to existing well-known, resource-rich, systematic synthetic phonics programmes available in 2007 – and yet not only in England but also increasingly across the world, this publication is still promoted as a high-quality programme in line with the stated claims of the originators. Furthermore, central to many phonics programmes is a mnemonic system (aid to memory) to help beginners to learn the links between the letters and letter groups and the sounds they are code for. The use of a mnemonic system is recommended in ‘Letters and Sounds’ to teach the letter/s-sound correspondences of the basic alphabetic code but only three examples are described (for /s/ s, /y/ y and /sh/ sh). Would this be considered satisfactory for a commercial programme – or indeed any body of work presented as a high quality programme? A programme should surely not recommend a mnemonic system and then not go on to provide it. Even if a full range of examples were described in the publication, we return to the issue that no resources are provided in ‘Letters and Sounds’ such as mnemonic flash cards, or mnemonic frieze, to support the teaching and learning of the letter/s-sound correspondences. This means that teachers have to devise their own mnemonic system plus make their own mnemonic teaching and learning resources – or acquire them through a commercial route – so now we are no longer in the realms of ‘free’ programme because to equip ‘Letters and Sounds’ with some pretty basic resources is going to cost one way or another in terms of effort, time and money. Could it be that the official origins of ‘Letters and Sounds’ and, in England, fear of Ofsted inspection has diminished people’s capacity to evaluate what it is and what it isn’t – and six years later people continue to be misled. For some people, however, do they turn a blind eye to the realisation that ‘Letters and Sounds’ is simply not the high quality programme that is claimed because it has now taken on a life and momentum of its own – an unstoppable phenomenon? Quality control is far from guaranteed when it is left up to busy teachers to devise and equip a resource-less programme – and how does this square with sustained government persistence of ‘fidelity to programme’ – a notion that has been emphasised since the Rose Report (March 2006) and recently repeated in England’s government match funded phonics initiative (2011 – 2013)? Fidelity to ‘Letters and Sounds’ is impossible when teachers have to translate the guidance into resources according to their own judgement and experiences – possibly using other programmes and various commercial resources in attempts to turn ‘Letters and Sounds’ into a viable programme. Thus ‘fidelity to programme’ is surely a contradiction in terms when the guidance of a programme is simply incomplete and no resources are provided. How identifiable are ‘Letters and Sounds’ schools when teachers in every school have had to translate the guidance into practice and when many of these schools have adopted various other programmes, resources and practices in order to apparently deliver ‘Letters and Sounds”? I use the word ‘apparently’ deliberately, because many people’s delivery of ‘Letters and Sounds’ is not necessarily recognisable as ‘Letters and Sounds’ when you return to the original documents and compare the specific suggestions with the actual practice in the schools. Further, where activities are delivered close to the original suggestions, are these practical and effective in real schools with real children on a daily and annual basis? I have much more to add to support a view that ‘Letters and Sounds’ is not a programme and that there are dangers inherent within the guidance, but will continue to build up the picture in bite-sized chunks over time. The continuing critique will examine likely scenarios and outcomes for teachers and children when the suggested activities described within ‘Letters and Sounds’ have been fully equipped to consider their advisability – what is the teaching and learning likely to look like when the guidance has been followed closely? This entry was posted in DfE (Department for Education - UK), Education, Government Policy, Letters and Sound, Literacy, Phonics, Teacher Training and tagged phonics, reading, teaching on December 11, 2013 by Debbie.